Each Manual Coffee Grinder includes brew guides, how-to videos, and a 100 percent money back guarantee. The advanced burr design has been tested to last 6 times longer than the existing model and will allow the user to grind their coffee 18% faster than before. These upgrades are expected to be available in July 2016 for all JavaPresse customers. 2015 startup JavaPress Coffee Company today announced the record-breaking success of its first ever full quarter (1Q 2016), noting that over 5200 coffee grinders had been sold between January and April since its launch in September. 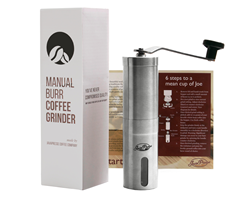 The burr coffee grinder by JavaPresse Coffee Company was designed to be easy to use, grinding beans in between two to five minutes. Depending on how users like their beans ground, the grinder can offer every setting between extra fine to coarse for the perfect morning cup. Publicity about the grinder has spread all over the internet, with industry enthusiasts such as The Coffee Detective naming the JavaPresse product his new “hand grinder of choice” in this in-depth review of the coffee mill. Worked through a hand crank mechanism, the grinder is highly portable and requires no electrical outlets in order to operate, making it the perfect morning companion for campers and hikers. The hand coffee grinder is also ideal for grinding a coffee quietly, without the loud jarring noises associated with its electrical counterparts. Following the company’s successful first quarter, JavaPresse Coffee Company has already started working on a new range of products and services for its customers over the rest of 2016 and further into 2017. In addition to new products, JavaPresse Coffee Company will also be releasing a newly reinforced burr design to complement past, present, and future models of the coffee grinder. The advanced burr design has been tested to last 6 times longer than the existing model and will allow the user to grind their coffee 18% faster than before. These upgrades are expected to be available in July 2016 for all JavaPresse customers. In the meantime, coffee lovers who have not yet experienced the uniform consistency of the coffee grinds produced by the manual coffee grinder from JavaPresse can purchase it on Amazon.com here: http://www.amazon.com/dp/B013R3Q7B2. For a limited time only, customers can enjoy a 18% discount off the regular price of $21.99 using code JAVAPR18. Each purchase is supported by JavaPresse Coffee Company's 100 percent money back guarantee.